The Schnoodle is not a purebred dog. 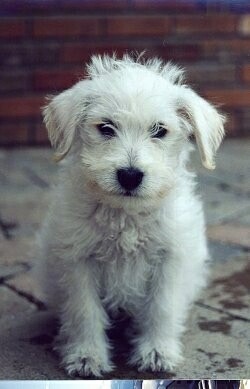 It is a cross between the Miniature Schnauzer and the Poodle. The best way to determine the temperament of a mixed breed is to look up all breeds in the cross and know you can get any combination of any of the characteristics found in either breed. Not all of these designer hybrid dogs being bred are 50% purebred to 50% purebred. It is very common for breeders to breed multi-generation crosses. 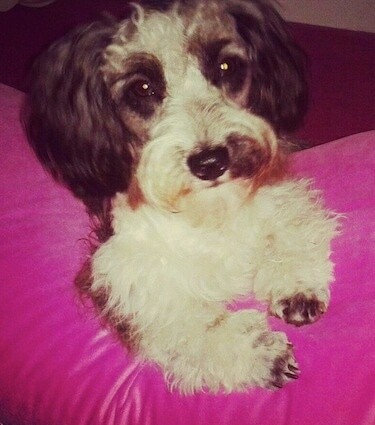 Sandy the adult Schnoodle (Schnauzer / Poodle mix breed dog)—"The Schnoodle is very loyal to his family, affectionate, extremely intelligent, easily trained, clever, friendly, fun loving, with plenty of personality! They are good with children and get along fine with other animals. They are great watchdogs because they will let you know when someone is near, but they are non-aggressive. They not yappy dogs unless you allow them to take over your home. They love car rides. This great companion dog excels in obedience, agility, Flyball and makes an excellent therapy dogs, but they are first and foremost a loyal and loving companion! They would be fine in an apartment or on a farm, as long as they are with their family. These dogs are so loyal and affectionate they would not be happy kept outdoors. As far as exercise, the Schnoodle is very adaptable. A game of fetch played in the house or a 5-mile jog, either one is fine with them. Because the Poodle and the Schnauzer both do not shed, the Schnoodle does not shed so they must be brushed weekly and clipped every 6 to 12 weeks, depending on the length of hair preferred. Their nails should be kept trimmed. 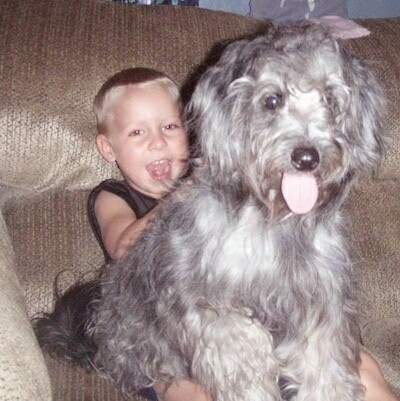 The Schnoodle sheds little to no hair and is considered good for allergy sufferers." Charlie the Schnoodle at 8 weeks—"He is becoming more beige with age (now 14 weeks), easily housebroken and very affectionate. Quick to learn and can wear himself out playing. Very, very inquisitive and loves to chew his toys. Picked up his name, "fetch," "sit," "pee-pee" and "poopers" quickly(although seems a little bashful). Took to the leash well. A little yappy with the neighbors and outdoor sounds. Loves people—presents his little tummy with ease. Plays hard with other dogs and doesn't share toys well. When running on "puppy power" (somewhere between speed of sound and wartends to wipe out He is a little headstrong—little more coaxing required. Often willful—you can see the wheels turning. Hasn't figured out goldfish in our little pond—we're afraid he will attempt his own sushi recipe soon!" "Let me introduce you to Arlington aka Arlie. 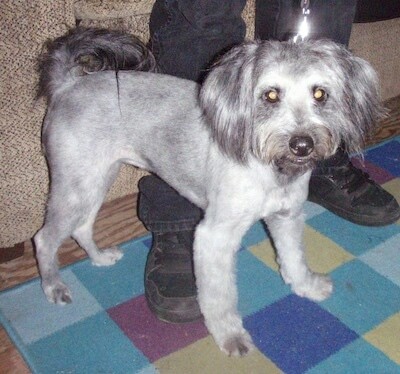 Arlie is a Standard Schnoodle shown here at 9 months old. 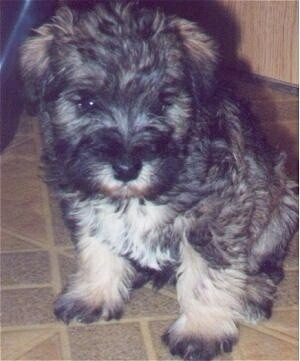 His mother was a Giant Schnauzer and dad was a Mini Poodle. "Arlie is quite the main attraction when walked throughout our nation's capital (Washington, D.C.), which is 5 miles from our home in Arlington, VA. Not a day goes by when people do not stop us to ask what kind of dog Arlie is. 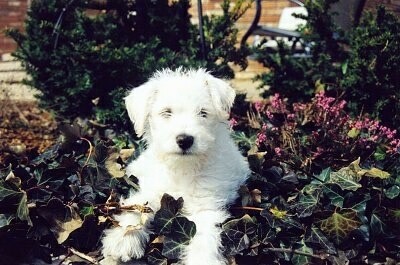 In fact, after playing with Arlie and seeing him walked daily, many people have inquired about Schnoodles. "Arlie has two favorite things. He loves to be cuddled and loved. We are fortunate to have gotten a dog that loves endless hugs, kisses and cuddles. He also loves to play tug with his rope. Doesn't matter what kind of rope as long as it's long and someone is at the other end pulling. He will drop the rope when asked and has been very easy to train." 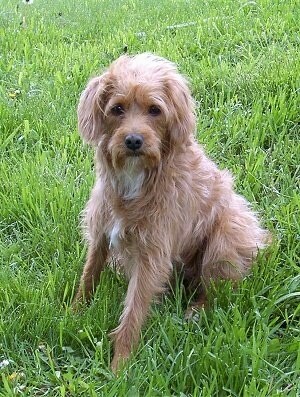 "This is a photo of Philippe the Schnoodle, a dog we adopted from Animal Control 8 weeks ago. He is probably about 2 years old. His DNA test showed that his genetic markers are more than 75% Schnauzer and it is easy to see some characteristics, especially in the way he stands. His legs are very long, though, and his hair is soft and wavy. He is very affectionate, energetic and eager to learn. He is 16 inches tall at the shoulders." 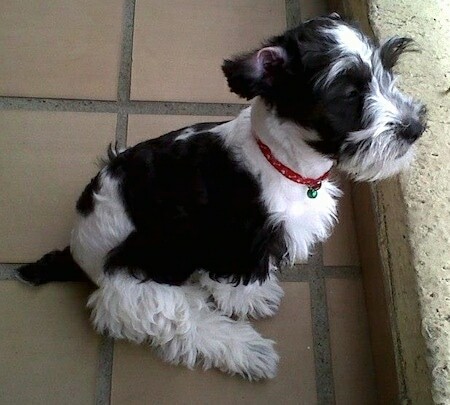 Shadow the Schnoodle with a long coat—"This is Shadow. 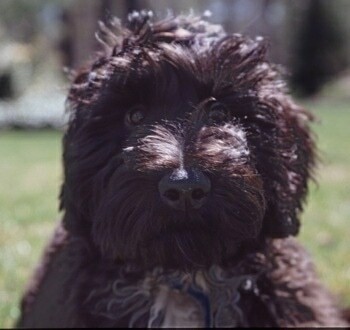 She is a 14-month-old Schnoodle. We rescued her. She has a wonderful personality and she has a high energy level. She loves car rides and boating. She doesn't like to be left alone. She is a very loyal dog. She loves to play with our kids and she also loves to cuddle and give lots of kisses. She is a sweet and playful dog."